Turquoise Place Resort is located in Orange Beach Alabama. Have you heard of Orange Beach? Maybe not. It is still relatively unknown to travelers outside the south. Orange Beach is located on the Alabama/Florida Line. Thus, the location has the same white sandy beaches and blue ocean as the better known Florida Panhandle. Have you heard of Destin? Much more likely that you have. Orange Beach use to be a sleepy fishing town with beautiful beaches. It is still a fishing town, but not as sleepy as it once was due to many new luxury resorts and commercial development. Turquoise Place is a modern and luxurious condominium resort that is located right on the beach. 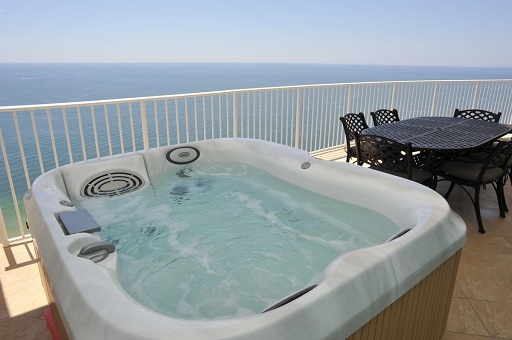 Every condo at Turquoise Place has a gulf-front balcony with amazing views of the Gulf of Mexico. Even better, all of the Turquoise Place balconies have a hot tub and outdoor kitchen. This is a WOW factor for Chic Family Travels. The Turquoise Place condos start at 2300 square feet and go up from there. The prices vary depending on the time of year you plan on visiting but during the high season a 3 bedroom averages $4800 with all taxes and fees included for the week. Two families could easily share this spacious condo making it an affordable luxury vacation in Orange Beach Alabama. The Turquoise Place condo interiors are amazingly luxurious with amenities such as wolf gas ranges, sub zero refrigerator, living room fireplaces, flat screen tvs (even in the bathroom) and jacuzzi tubs. You can truly spend a week like a rock star at Turquoise Place for a fraction of what it would cost to visit the Caribbean or even the Florida Panhandle.